I recently built a drum sander. 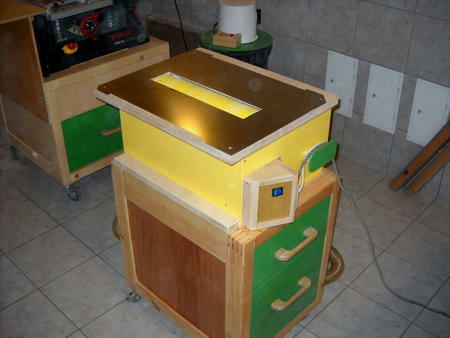 This is the eighth machine I have built. 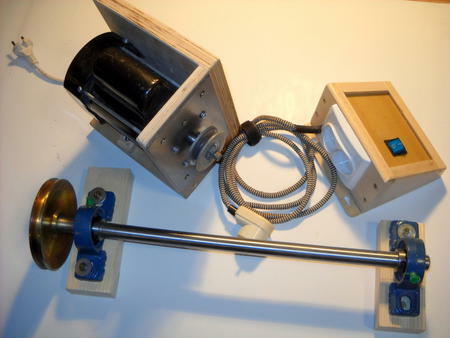 I reused two parts from my lathe project to power the sander: the power module and motor module. 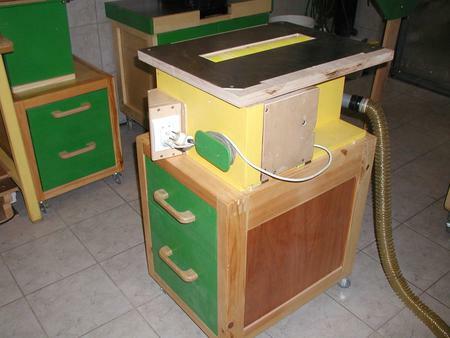 These are easy to move between the machines. 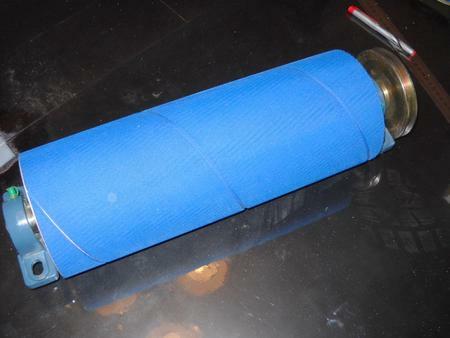 The drum is 400 mm long and 140 mm in diameter. 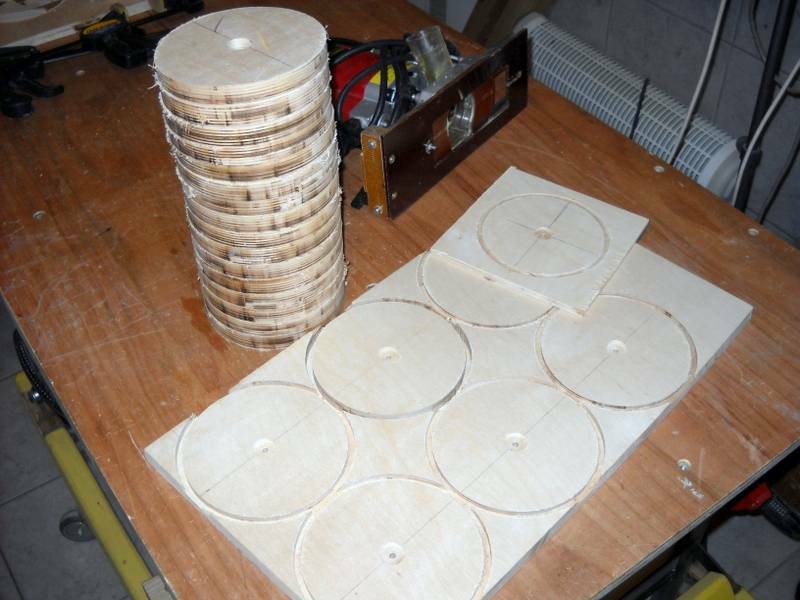 It's made of 22 discs which were cut with a router from 18 mm plywood. 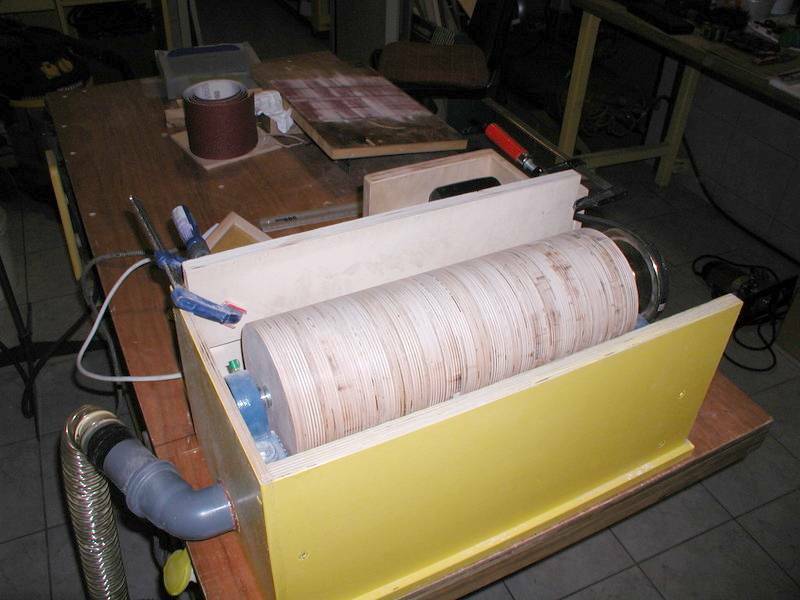 The discs are mounted on a 20mmx500mm steel shaft and glued together with polyurethane glue. 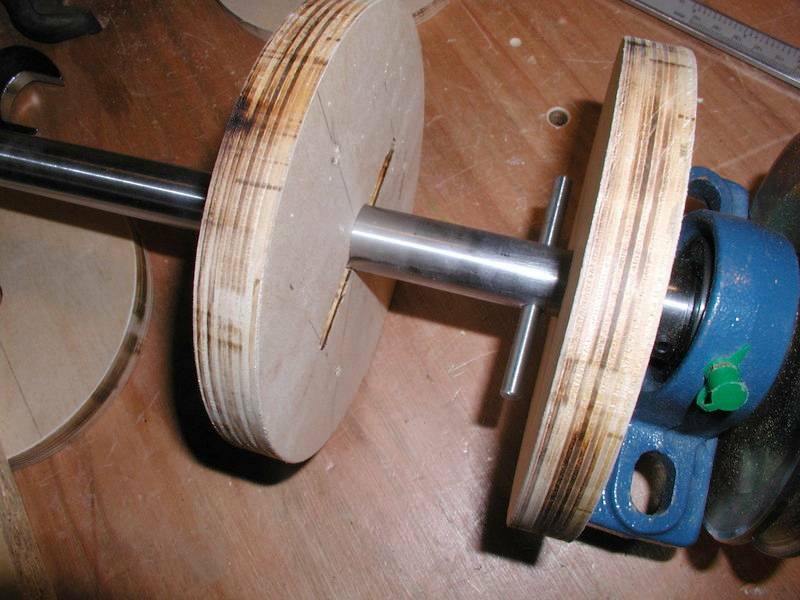 A steel rod, 6mm x 70 mm goes through a hole in the shaft at either end to lock the disks to the shaft. Both ends of the shaft are mounted on ball bearings. 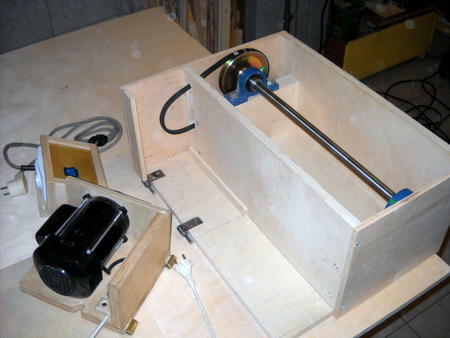 On the right side there is also a 120 mm diameter pulley which turns the drum at 1400 RPM. 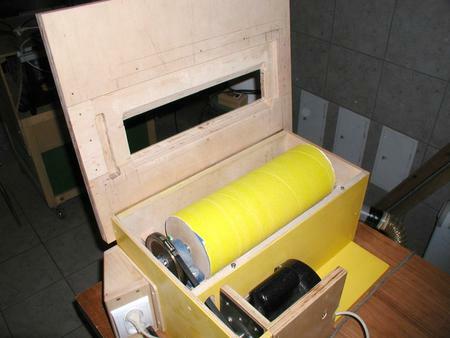 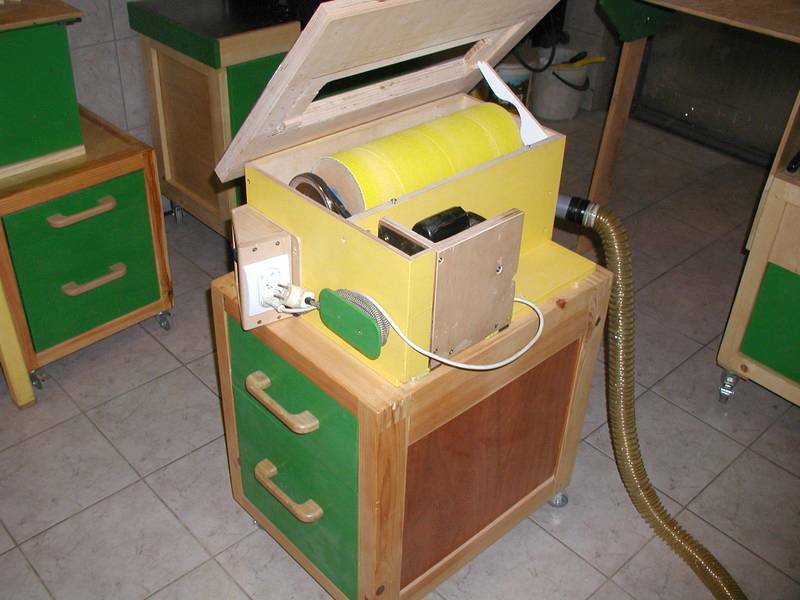 The sander's housing is 520 mm x 270 mm x 240 mm, mostly made of 18 mm plywood, with 10 mm plywood for the sides. 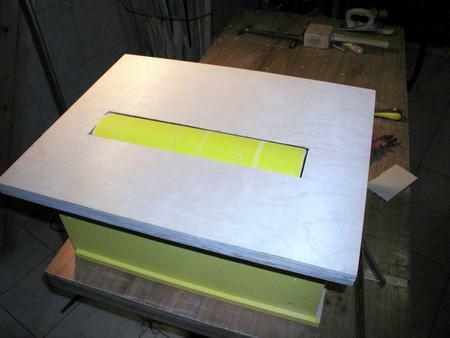 Two layers of plywood are glued together where the bearings mount. 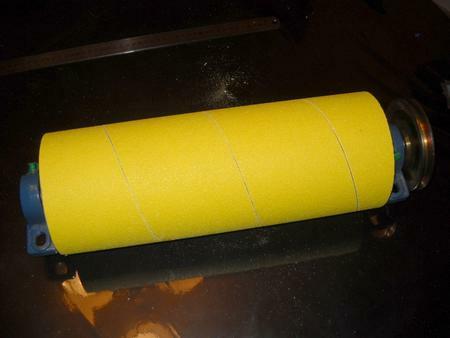 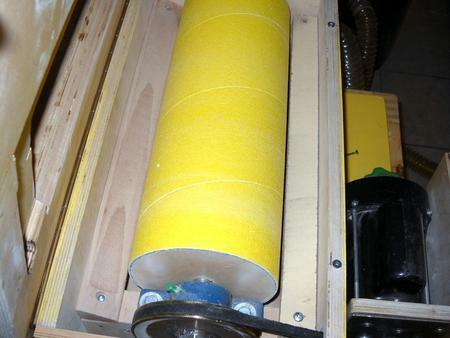 After sanding and painting, a Velcro belt was wrapped around and glued to the drum to hold the sandpaper. The motor module is mounted on two hinge pins that are fastened to the base plate. 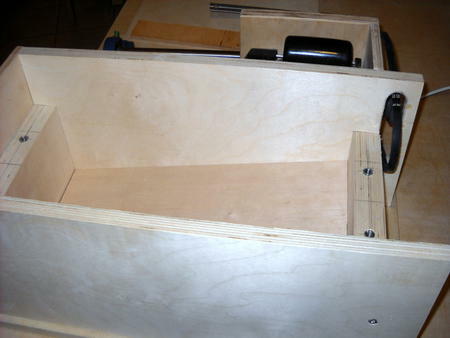 The bottom of the box is inclined at 15 degrees to slope towards the dust extraction hose. 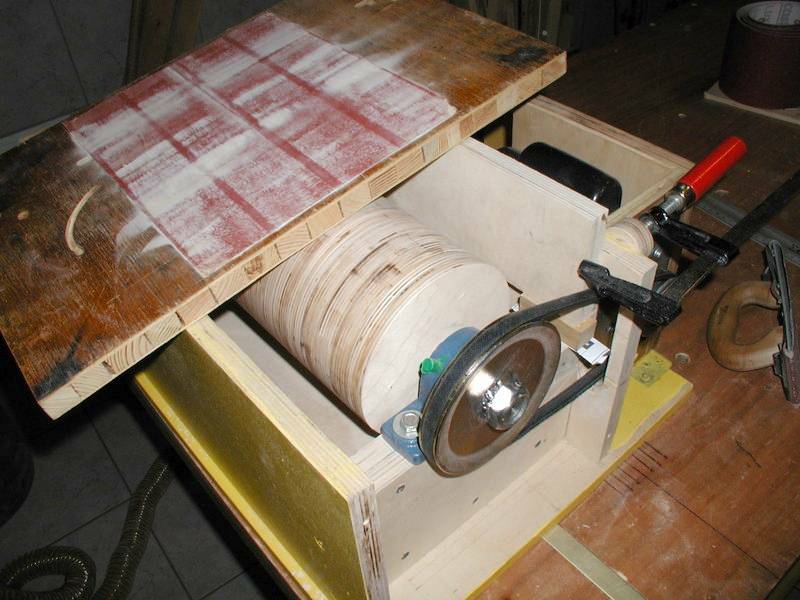 To help pull sawdust off the drum, two strips are mounted near the drum to create an area with additional suction around the bottom of the drum. The top is 470 mm x 600 mm x 30 mm, made of two layers of plywood, 18 and 12 mm thick, glued together. 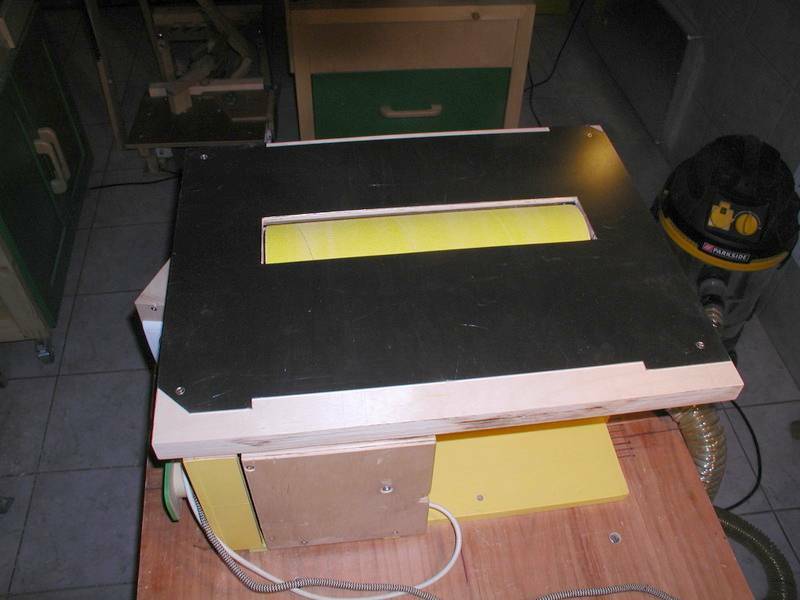 The top is covered with 2.5 mm steel, which ensures a durable sliding surface. 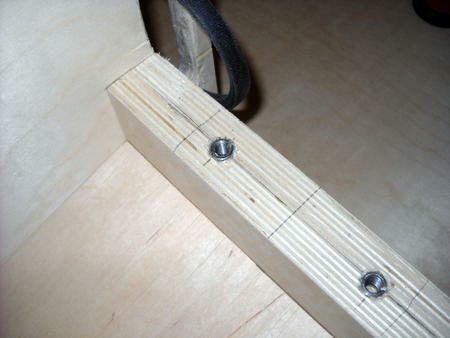 The top is hinged on one side, and on the other side rests on two screws for height adjustment. 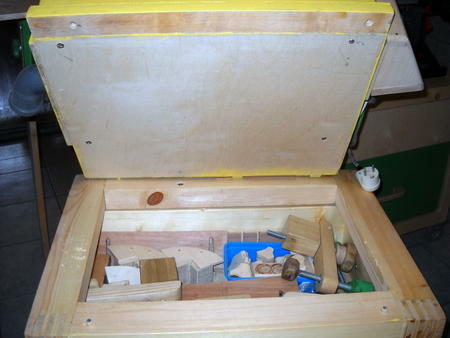 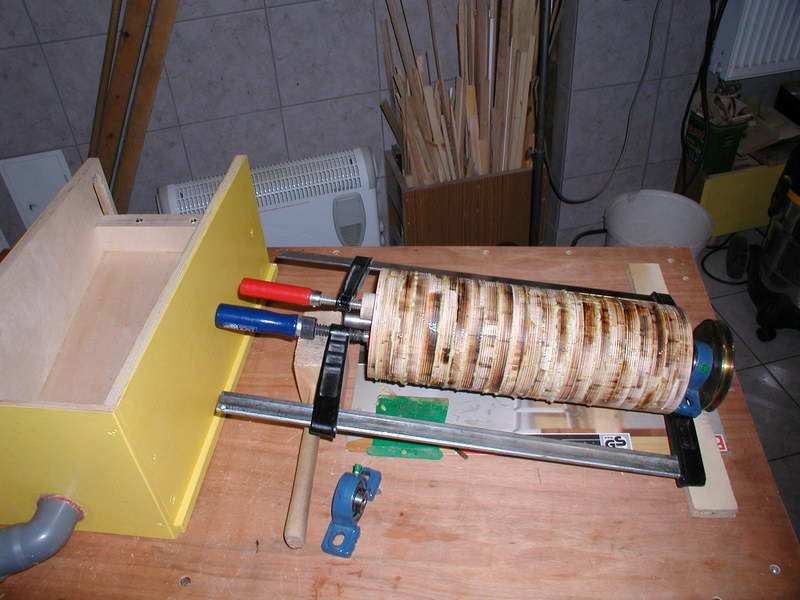 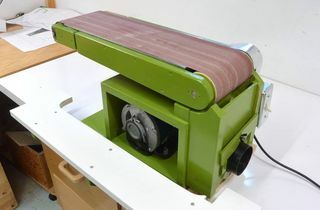 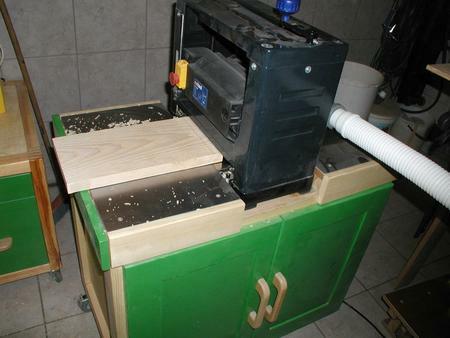 The drum sander is on a mobile base, which I also use for the pantorouter. 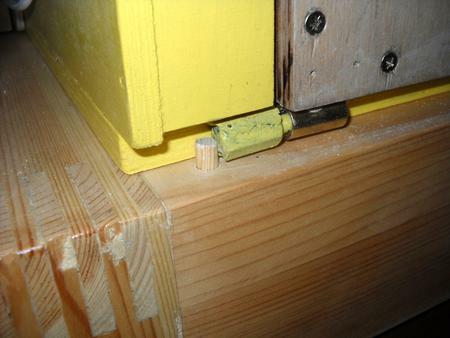 Four 10 mm dowel pins in the base match with holes and edges of the sander to ensure the sander does not slide on the base. 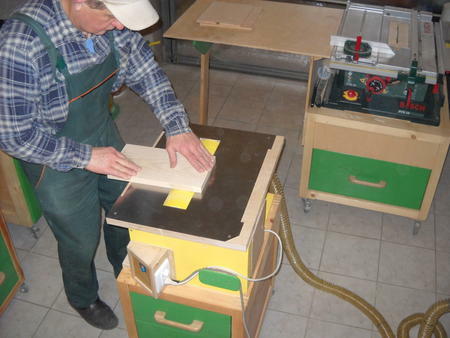 I will use this sander to smooth boards planed with my 10-inch thickness planer. I plan on using this when building the railings for my porch, which I will do this spring. 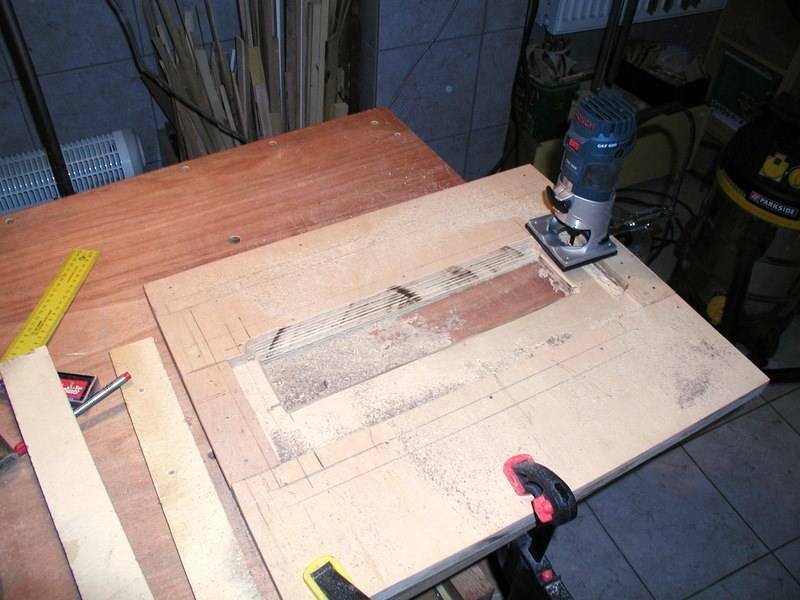 My cheap 10" thickness planer does not cut very clean (it may need some work).